1. This week I discovered a "new" artist (who was originally inspired by Steven Curtis Chapman, btw.) A friend sent me the title song from this CD and after hearing it I went out and bought the album. I highly recommend it. 2. Bookworm1's birthday is coming up here shortly and I'm learning to sew in order to prepare some items for the big day. I'm very grateful to a special and very dear friend of mine who gave up some of her time this week to come over and show me how to figure the pattern out and put the item together. Curious? Well, stay tuned! 3. Jonathan and I watched the movie Fireproof (finally!) this week. I can't believe this movie did so well in theatres (but I'm grateful). Click here to see my review of Fireproof. 4. I went to the dentist and I did not die. (Since I was pretty sure I WOULD die, this was a relief. I hate going to the dentist.) Furthermore, nothing whatsoever is wrong with my teeth. They just needed a cleaning. I asked my dentist how proud I could be of this fact. He suggested that although I have good genes when it comes to teeth, perhaps I shouldn't gloat so much but give credit where credit is due (i.e., my Creator). So thanks, God, for healthy teeth! This would have been me (in the chair) as a child, and my mom at the door. Now it's my husband at the door. I'm still the one being bribed in the chair. I'm so glad for you that all you had to do at the dentist was to get a cleaning! I loved Fireproof. I wish every married couple would see it. I totally understand how you feel about going to the post office. I'm always putting it off, too. 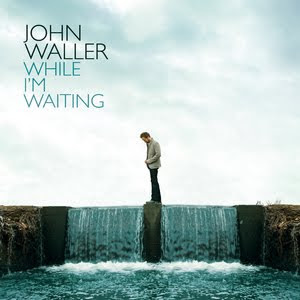 I've only heard that one song from John Waller but I absolutely love it! I would probably love the whole album. Thanks for recommending it. Have fun learning to sew. I can't say I ever enjoyed it, but it's good to know how when you need to. 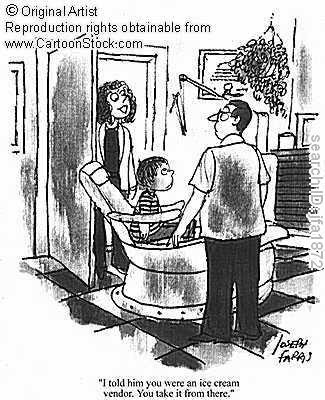 Love the dentist cartoon. So funny. I like my dentist. I hate being in his chair. He understands my dentist phobia and works hard to help me through the process. Hurray for good teeth! Don't you love it when you finally do a chore you dread? What a great feeling! Glad you were able to get rid of that post office pile and that you lived through the dentist. I always sweat in that stupid dentist chair...not perspire...SWEAT! I survived a trip to the dentist this week as well, its not fun. But I still have not seen Fireproof. . . I am sure I will one of these days. I think that song of John Waller's is in the movie Fireproof, isn't it? I just discovered him too and his CD is on my to buy list. As is the movie Fireproof. I haven't seen fireproof but I've heard that it's great. I hope to see it one day.